In 1992, I attended King’s College in London for two terms as part of a study abroad program. I knew next to nothing about the school, and if I remember correctly, I chose it, because it was located on the Strand and seemed to be in the middle of everything. My interest in the Beats and, particularly, William Burroughs had been growing in leaps and bounds since I first encountered them in the summer of 1990 after my freshman year of college. Little did I know that King’s was the ideal place to expand my knowledge of post-WWII American fiction. In fact, the school was the birthplace of American Studies in Great Britain due to the pioneering work of scholar Eric Mottram. Through his teaching, presence and writings, Mottram placed the work of the Beats under the critical microscope and brought it to a whole generation of British readers. Mottram taught full-time at King’s College until the early 1990s so I just missed him. He continued to teach part-time in a limited capacity until 1994 so his presence was felt in the English Department. His name graced the professorship in American Literature at Kings as testament to his influence. The position was held by Clive Bush, and it was through his class that I first came in contact with Charles Olson and The Maximus Poems. One of the best aspects of King’s College was that being enrolled as a student granted me access to the University of London’s ring of libraries. The libraries directly associated with King’s were rather small, but the University of London possessed fantastic facilities throughout the city. Senate House provided George Orwell with the architectural inspiration for the imposing Ministry of Truth Building in 1984. Rumor had it that a library office in Senate House served as the model for Room 101 in the Ministry of Love. During WWII, the Ministry of Information was headquartered at Senate House. Orwell worked for the Ministry of Information before writing 1984. For me the library was a great source of information and love. I read in the library voraciously, walking through the stacks of American Literature with abandon. I first read Robert Creeley and J.P. Donleavy in London as well as Paul Bowles’ The Sheltering Sky. To read that book as I traveled with a backpack throughout Europe was a wonderful experience. I found a collected works of D.A. Levy at the library. I read the introduction and then the remarkable poems wondering how I never heard of the Cleveland poet suicided by Middle America. In fact, I have never seen Levy’s work in the United States except at rare bookstores. I like to think that the Levy collection was in London due in large part to the energy of Mottram’s work and personality. Unbeknownst to me at the time I studied there, King’s College Library houses Mottram’s considerable archives. This is a treasure trove for anybody interested in post-WWII literature. Over the years, I have spent considerable time looking up little magazines and little presses in the Mottram collection. The list really reads like a complete bibliography of little magazines / little presses of the period. Unfortunately King’s College is not mining this resource. The website has not been updated since 2000. There were plans for a volume of the Mottram / Duncan correspondence but to my knowledge this has not come to pass. As Robert Bank’s assemblage makes clear, Mottram’s letters are full of valuable detail as well as interesting analysis of the experimental and counterculture scene in Britain and abroad. This correspondence would benefit anybody interested in 20 Century literature. Hopefully, the brief selection of Mottram / Nuttall letters on RealityStudio will open up this resource leading to further extracts being posted in the near future. 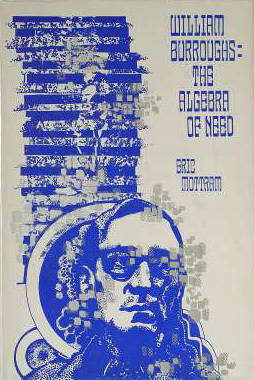 As many reading this will know, Mottram wrote the first book-length study of Burroughs’ work entitled The Algebra of Need. He also wrote books on Allen Ginsberg and Paul Bowles among others. Do not think for a moment that Mottram was holed up in the ivory tower writing from a distance about the outlaw literature of the post-war era. Robert Bank’s assemblage of materials chronicling Mottram’s activities in the mid-1960s makes clear that the Beat scholar was in the thick of the action and knew the writers intimately. Mottram talked the talk because he walked the walk. Read Bank’s piece to get all the details including some great letters to Jeff Nuttall, another valuable chronicler of the counterculture. This material provides a valuable companion piece to my column on Burroughs in the Lower East Side in 1965. Both these pieces highlight the fact that New York City was the center of the creative world, drawing artists, writers, critics as well as hangers-on and tourists. I want to focus on The Algebra of Need as a means to highlight Mottram’s immersion in the literary community about which he wrote. The first version of the Burroughs study appeared in the Special Burroughs Issue (#14-15) of Intrepid magazine. In a few columns, I have touched on Intrepid. 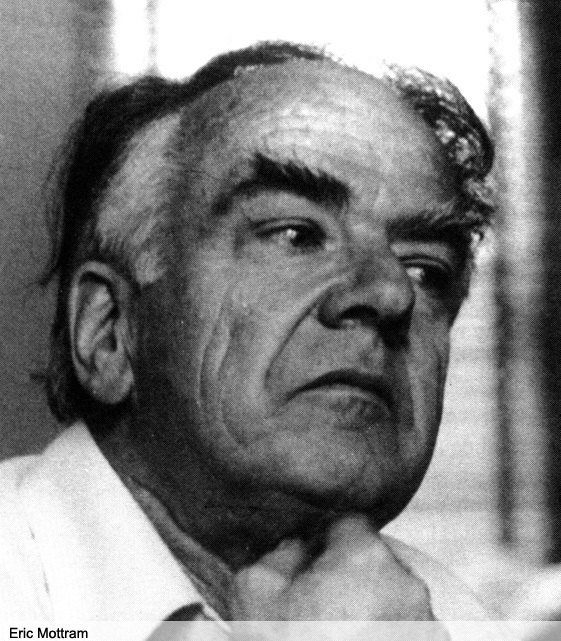 Allen De Loach edited the magazine out of Buffalo in the 1960s and 1970s. If you surf eBay for artifacts from the literary scene of that time, you have no doubt come across material from De Loach’s archives. He died in 2002 and bits and pieces of his considerable holdings (including Burroughs manuscripts and cassette tapes) have been appearing on the Web for quite some time. Mottram taught briefly at Buffalo in the 1960s. At the time, the University was a hotbed for the New American writers of the Donald Allen anthology. Charles Olson, Gregory Corso, John Wieners, and Robert Creeley all taught there. I am sure there were others. De Loach sponsored probably hundreds of readings and lectures. As a result of the poets’ presence, particularly Olson’s, a dedicated and incredibly prolific group of writers and scholars grew out of this oasis. The State Unversity at Buffalo remains a major location on the experimental poetry map to the present. The Electronic Poetry Center and the Poetics Listserv are pioneering and invaluable internet resources dealing with all aspects of what was, is, and will be new and innovative in modern poetry. Mottram’s study came out of this incredibly fertile time for the academic world around Buffalo. 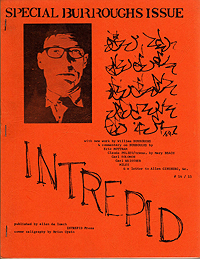 The Special Burroughs issue of Intrepid was a major publication for Burroughs: the first magazine dedicated to all aspects of his career to that point. The little magazine has a long history of being at the forefront of not only publishing the freshest voices in literature before the mainstream publishers dare to, but also of being at the head of the line in providing a critical context for those new writers. This is particularly true of Beat scholarship. While Ann Charters really got the ball rolling with Kerouac scholarship with her monumental bibliography and biography, the little magazine had kept the flame of his reputation burning during the darkest hours of Kerouac’s literary reputation in the 1960s. An essay by Warren Tallman in 1959 on “Kerouac’s Sound” opened many doors and minds as well. Fanzines, like the Moody Street Irregulars, Beat Scene, and The Kerouac Connection, extended Charters’ work in the 1970s doing much of the digging in the archives, texts, and libraries that would uncover the writer behind the myth. The results of this early scholarship are still being realized today. 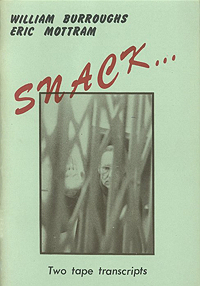 Like Kerouac, Burroughs scholarship began in the little magazines. For example, Big Table, Evergreen Review, and Kulchur all published incredibly influential critical pieces on Burroughs simultaneously with his fiction. So the publication of The Algebra of Need in a little magazine out of Buffalo is not so strange and in fact just right. 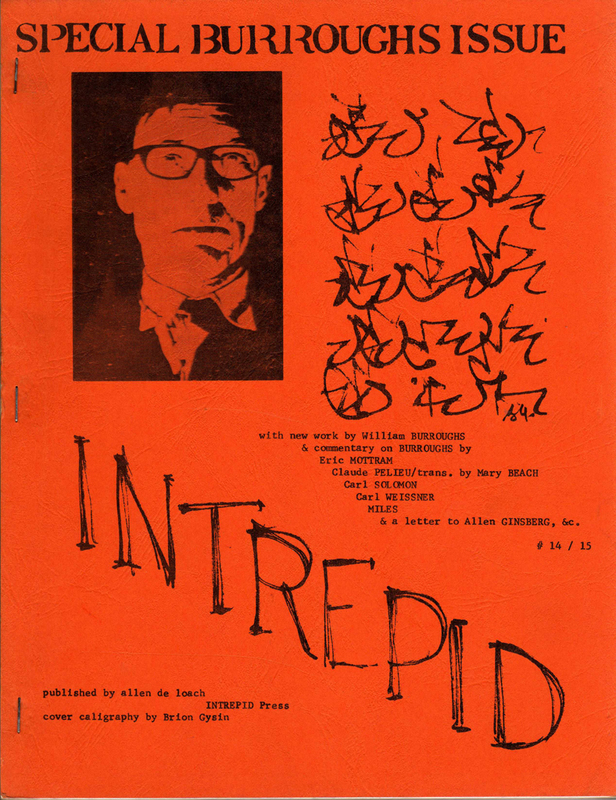 Intrepid 14/15 features artwork by Gysin on the cover that had become a logo of sorts for the magazine. The magazine included older cut-up material from the trilogy as well as new work on scientology and the E-meter. Besides Mottram’s piece, there were recollections and critical pieces by Alan Ansen, Harold Norse and Claude Pélieu. Later in 1971, Intrepid Press published The Algebra of Need in book form as Number 2 of the Beau Fleuve series. This small press publication again highlights Mottram’s central location in the literary community in which he taught and wrote about. Other publications in this series include: Three Dreams and an Old Poem (Paul Blackburn, Number 1), From Maine (Allen De Loach, Number 3), Black Is Black Blues (Ray Bremser, Number 5), Dear Allen: Ship Will Land Jan 23 58 (Peter Orlovsky, Number 5), Some Plays: On Words (Victor Coleman, Number 6), and Narcissus (Bill Cirocco, Number 7). 100 hardbound and signed copies of Mottram’s book were published along with an additional 1125 hardcovers and 2375 in wrappers. Copies appear on eBay from time to time. As I was writing this, a copy of Intrepid and the paperback verison were both available. The Intrepid issue is a must-have for the magazine collector. The book verison is nice as well. I was lucky enough to find a copy in wrappers at a bookstore in Maine. Like the Special Burroughs issue of Intrepid, the signed copies of Algebra have become something of a collector’s item fetching over $150. Mottram revised and added material to the book over the years and it has been reprinted. This is testament to the immense influence of this critical work. 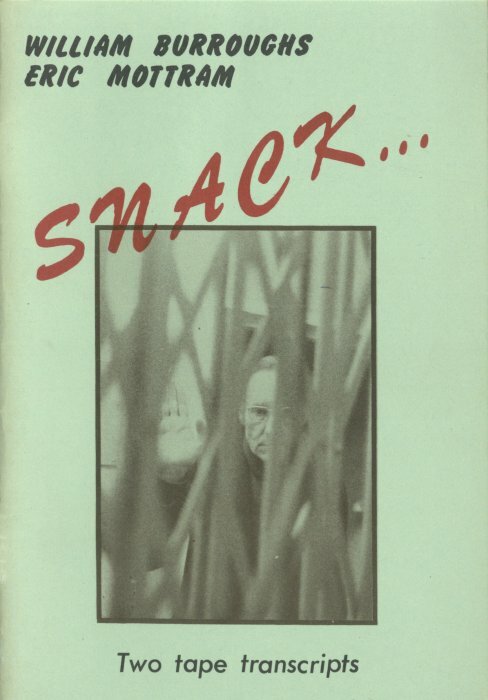 Despite the early reception of Burroughs’ work in little magazines, Mottram’s study, like Charter’s with Kerouac, really began the process of critical acceptance of Burroughs and paved the way for his contested entrance into the academy and canon. Reading the book, it is clear that Mottram feels the need to legitimize and sanitize Burroughs’ work. By 1970 Burroughs’ work had to be freed of the cloud of obscenity and censorship that had shrouded it since its initial publication. As a result, Mottram had to explain the morality of Burroughs’ work. This is most clear in the description of the ejaculating hanging man images as a satire or comment on capital punishment. The work of Swift comes to the forefront. Kerouac started this line of inquiry in 1957. The thoroughness and intelligence of Mottram’s book would demonstrate this line of thought once and for all, thus establishing in academic circles the literary and critical value of Burroughs’ novels and opening up for inquiry new approaches and new lines of questioning. It is no surprise that criticism in the 1970s and onward would largely take for granted Mottram’s assessments and build on this foundation into the realms of literary theory, language and visual art. The Algebra of Need in its first edition deals with the first cycle of Burroughs’ career encompassing Junkie, Naked Lunch and the cut-up experiments and novels. Later revisions expanded to include the shift in Burroughs’ work of the late 1960s towards film techniques, youth revolt, and more restrained use of the cut-up. For example, the 1977 reprint of The Algebra of Need included a reading of The Last Words of Dutch Schultz. Mottram quotes the relevant texts extensively. He does not interrogate the manuscripts, letters, and archival material. Only with Mottram’s study could a fuller, more detailed study begin that would take into consideration the raw material that the novels were built from. To my mind, the most innovative aspect of Mottram’s book was its inclusiveness. Mottram does not ignore the work that appeared in little magazines and the small press. To be sure the study focuses on the major novels but Mottram is clearly aware of the importance of the little magazine and Burroughs’ less well-known works. Particularly with the cut-ups of the 1960s, Burroughs’ most radical work never found a mainstream publisher. Mottram acknowledges the presence of the cut-up experiments like Minutes to Go and The Exterminator as well as the pieces in My Own Mag. More than 30 years later, scholars have yet to take up Mottram’s lead. Much critical work has built up around the Grove and mainstream novels, but the work of the small press and little magazines sits relatively in the shadows of academic inquiry. As a result, a fuller understanding of Burroughs’ achievement remains in our future. Scholars, like Oliver Harris and Davis Schneiderman, are opening the archives and digging into neglected works like Minutes to Go and The Yage Letters as well as the riches in Locus Solus and My Own Mag. Hopefully, they will maintain ties with the vibrancy of the literary and artistic community that remains from the post-war era as well as the one that thrives today. As Robert Bank’s piece shows, Mottram’s work benefited from such contacts. In addition, we can only hope that future critics will possess Mottram’s love and respect of the work, not to mention his perceptive intelligence. Written by Jed Birmingham and published by RealityStudio on 13 April 2007. Here is a link to more info on the poetry scene that developed in Buffalo around Charles Olson. Mottram is mentioned in the article. I ordered The Algebra of Need today and after reading your article going into detail about it’s contents I am even more excited for its arrival! I hope you like it. What edition you buy?